Beschreibung: The Volta Complex is located in Basel´s St. Johann district, offering modern furnished apartments with easy access to the city and corporate centres. This modern apartment is located in the Volta Complex and has a generous layout with a lot of space to relax and entertain. 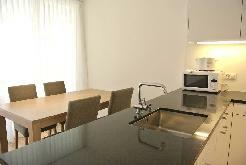 The fully equipped kitchen includes a dishwasher, a ceramic cooking surface and modern appliances. The stylish bathroom is equipped with a tub or a shower as well as a washing machine and a dryer. The bright and spacious open-plan kitchen/living/dining area with leather sofas and comfortable dining chairs easily allows to cater for guests. The master bedroom is equipped with a queen-sized bed, a big wooden wardrobe as well as chest of drawers. The guest bedroom includes two single beds, a wardrobe and a chest of drawers. The underfloor heating distributes the warmth evenly and ensures an optimal room temperature throughout the year. Equipped with a telephone system, secure high-speed wireless internet and digital TV, this apartment offers a comprehensive package. The Volta Complex combines great public transport connections with all the qualities of a central but nevertheless quiet residential area. The grocery store Coop next door contributes to the convenience of your stay. Voltastrasse has transformed to a trendy residential district, offering a mix of local and chain shopping facilities. Nearby this location are a number of charming nooks of greenery such as Voltamatte, St. Johann Park or the large Kannenfeld Park. The river Rhine is only a short walk away from the apartment.